"I recommend that you read and use the information in this book to provide your athletes with the best chances of performing at their best"
This book provides the latest scientific and practical information in the field of strength and conditioning. The text is presented in four sections, the first of which covers the biological aspects of the subject, laying the foundation for a better understanding of the second on the biological responses to strength and conditioning programs. Section three deals with the most effective monitoring strategies for evaluating a training program and establishing guidelines for writing a successful strength and conditioning program. The final section examines the role of strength and conditioning as a rehabilitation tool and as applied to those with disabilities. This book is an invaluable textbook and reference both for academic programs and for the continuing education of sports professionals. Dr. Marco Cardinale is the Head of Sports Physiology at Aspire Academy in Qatar. He was the former Head of Sports Science and Research of the British Olympic Association. 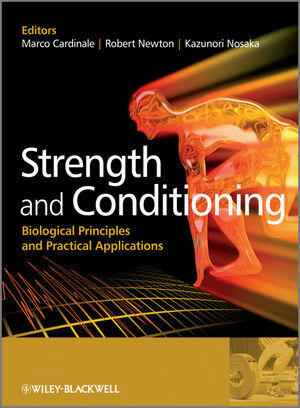 Robert Newton is the editor of Strength and Conditioning: Biological Principles and Practical Applications, published by Wiley. Kazunori Nosaka is the editor of Strength and Conditioning: Biological Principles and Practical Applications, published by Wiley. 1.1 Skeletal Muscle Physiology (Valmor Tricoli). 1.2 Neuromuscular Physiology (Alberto Rainoldi and Marco Gazzoni). 1.3 Bone Physiology (Jörn Rittweger). 1.3.4 Mechanical functions of bone. 1.3.5 Adaptive processes in bone. 1.3.6 Endocrine involvement of bone. 1.4 Tendon Physiology (Nicola Maffulli, Umile Giuseppe Longo, Filippo Spiezia and Vincenzo Denaro). 1.5 Bioenergetics of Exercise (R.J. Maughan). 1.5.2 Exercise, energy, work, and power. 1.5.4 The tricarboxylic acid (TCA) cycle. 1.6 Respiratory and Cardiovascular Physiology (Jeremiah J. Peiffer and Chris R. Abbiss). 1.7 Genetic and Signal Transduction Aspects of Strength Training (Henning Wackerhage, Arimantas Lionikas, Stuart Gray and Aivaras Ratkevicius). 1.7.1 Genetics of strength and trainability. 1.7.2 Signal transduction pathways that mediate the adaptation to strength training. 1.8 Strength and Conditioning Biomechanics (Robert U. Newton). 1.8.2 Biomechanical concepts for strength and conditioning. 1.8.5 Biomechanics of muscle function. 1.8.6 Body size, shape, and power-to-weight ratio. 1.8.9 Biomechanics of resistance machines. 1.8.10 Machines vs free weights. 2.1 Neural Adaptations to Resistance Exercise (Per Aagaard). 2.1.2 Effects of strength training on mechanical muscle function. 2.1.3 Effects of strength training on neural function. 2.2 Structural and Molecular Adaptations to Training (Jesper L. Andersen). 2.2.2 Protein synthesis and degradation in human skeletal muscle. 2.2.3 Muscle hypertrophy and atrophy. 2.2.4 What is the significance of satellite cells in human skeletal muscle? 2.2.5 Concurrent strength and endurance training: consequences for muscle adaptations. 2.3 Adaptive Processes in Human Bone and Tendon (Constantinos N. Maganaris, Jörn Rittweger and Marco V. Narici). 2.4 Biomechanical Markers and Resistance Training (Christian Cook and Blair Crewther). 2.4.2 Testosterone responses to resistance training. 2.4.3 Cortisol responses to resistance training. 2.4.4 Dual actions of testosterone and cortisol. 2.4.5 Growth hormone responses to resistance training. 2.4.7 Limitations in the use and interpretation of biochemical markers. 2.4.8 Applications of resistance training. 2.5 Cardiovascular Adaptations to Strength and Conditioning (Andy Jones and Fred DiMenna). 2.5.3 Cardiovascular adaptations to training. 2.5.4 Cardiovascular-related adaptations to training. 2.6 Exercise-induced Muscle Damage and Delayed-onset Muscle Soreness (DOMS) (Kazunori Nosaka). 2.6.2 Symptoms and markers of muscle damage. 2.6.3 Relationship between DOMS and other indicators. 2.6.4 Factors influencing the magnitude of muscle damage. 2.6.5 Muscle damage and training. 2.7 Alternative Modalities of Strength and Conditioning: Electrical Stimulation and Vibration (Nicola A. Maffiuletti and Marco Cardinale). 2.8 The Stretch–Shortening Cycle (SSC) (Anthony Blazevich). 2.8.2 Mechanisms responsible for performance enhancement with the SSC. 2.8.3 Force unloading: a requirement for elastic recoil. 2.8.4 Optimum MTU properties for SSC performance. 2.8.5 Effects of the transition time between stretch and shortening on SSC performance. 2.9 Repeated-sprint Ability (RSA) (David Bishop and Olivier Girard). 2.9.3 Ergogenic aids and RSA. 2.9.4 Effects of training on RSA. 2.10 The Overtraining Syndrome (OTS) (Romain Meeusen and Kevin De Pauw). 3.1 Principles of Athlete Testing (Robert U. Newton and Marco Cardinale). 3.1.2 General principles of athlete testing. 3.2 Speed and Agility Assessment (Warren Young and Jeremy Sheppard). 3.3 Testing Anaerobic Capacity and Repeated-sprint Ability (David Bishop and Matt Spencer). 3.4 Cardiovascular Assessment and Aerobic Training Prescription (Andy Jones and Fred DiMenna). 3.4.3 Aerobic training prescription . 3.5 Biochemical Monitoring in Strength and Conditioning (Michael R. McGuigan and Stuart J. Cormack). 3.5.4 Immunological and haematological monitoring. 3.6 Body Composition: Laboratory and Field Methods of Assessment (Arthur Stewart and Tim Ackland). 3.6.2 History of body composition methods. 3.6.3 Fractionation models for body composition. 3.6.4 Biomechanical imperatives for sports performance. 3.7 Total Athlete Management (TAM) and Performance Diagnosis (Robert U. Newton and Marco Cardinale). 4.1 Resistance Training Modes: A Practical Perspective (Michael H. Stone and Margaret E. Stone). 4.1.3 Strength, explosive strength, and power. 4.2 Training Agility and Change-of-direction Speed (CODS) (Jeremy Sheppard and Warren Young). 4.2.4 Perceptual and decision-making factors. 4.3 Nutrition for Strength Training (Christopher S. Shaw and Kevin D. Tipton). 4.3.2 The metabolic basis of muscle hypertrophy. 4.3.4 Acute effects of amino acid/protein ingestion. 4.4 Flexibility (William A. Sands). 4.4.3 A model of effective movement: the integration of flexibility and strength. 4.5 Sensorimotor Training (Urs Granacher, Thomas Muehlbauer, Wolfgang Taube, Albert Gollhofer and Markus Gruber). 4.5.2 The importance of sensorimotor training to the promotion of postural control and strength. 4.5.3 The effects of sensorimotor training on postural control and strength. 4.5.4 Adaptive processes following sensorimotor training. 4.5.5 Characteristics of sensorimotor training. 5.1 Strength and Conditioning as a Rehabilitation Tool (Andreas Schlumberger). 5.1.2 Neuromuscular effects of injury as a basis for rehabilitation strategies. 5.1.3 Strength and conditioning in retraining of the neuromuscular system. 5.2 Strength Training for Children and Adolescents (Avery D. Faigenbaum). 5.2.2 Risks and concerns associated with youth strength training. 5.2.3 The effectiveness of youth resistance training. 5.2.4 Physiological mechanisms for strength development. 5.2.5 Potential health and fitness benefits. 5.3 Strength and Conditioning Considerations for the Paralympic Athlete (Mark Jarvis, Matthew Cook and Paul Davies). 5.3.3 Current controversies in Paralympic strength and conditioning. 5.3.5 Considerations for specific disability groups. 5.3.6 Tips for more effective programming.